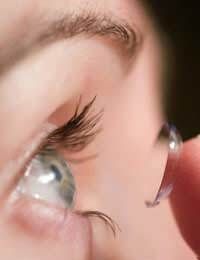 When contact lenses were first developed they were hard lenses. These lenses didn’t allow for oxygen to pass through the lens to the cornea. As they needed to be very small to leave the cornea uncovered as much as possible, they could easily fall out especially when blinking. Although these are still available for certain specialist needs they have largely been replaced by rigid gas permeable lenses. These lenses combine the functions of both hard and soft lenses. These are firmer than soft lenses but are made of oxygen permeable plastic. RGP lenses usually last longer than soft lenses and are very hard-wearing. Some prefer to wear these lenses as they are easier to handle than soft lenses. People with a high level of astigmatism are often prescribed RGP lenses. Once a person has got used to the lenses they are generally just as comfortable to wear as soft lenses.